Unfortunately, many Toppies have suffered with power supply unit (PSU) problems due to Topfield using cheaper electrolytic capacitors, not suitable for long-term operation in this type of circuit. Poor ventilation and not putting the Toppy into standby when not in use can greatly shorten the life of the PSU capacitors. As the capacitors deteriorate many strange behaviours and instability are possible, depending upon exactly what is happening to each of the many capacitors. Capacitors are fairly easy to diagnose and repair, but if the machine continues to be used, components such as a tuner or a hard drive may be damaged beyond economic repair. For that reason, if you suspect a PSU problem leave your Toppy unplugged until the voltages can be checked and necessary repairs carried out, even if it it works as a set-top box without being able to record. Some Toppies were affected as soon as 3 years after manufacture; all will be affected, according to use, as they age. The Topfield 5810 is also affected, although it has a different and simpler PSU; it may malfunction sooner as it generates more heat. If the cheap general-purpose capacitors are replaced by still inexpensive long-life low-ESR units, the repaired machine has the potential to give much longer service than it did originally. 3 Does the PSU need repairing? Luckily, the replacement of the capacitors affected is relatively simple, and has successfully extended the working life of numerous Toppies. The parts cost well under £10, and constitute the total cost of the repair if you have access to a multimeter and a soldering iron. Even if you need to purchase the tools for the job, the cost is still far less than a new PSU or worse, such as a new HDD or a new tuner, or even scrap the PVR. Much of the information needed to undertake this repair can be found in the newer, from 2011, PSU Repair thread on the Toppy.org.uk Forums. There is an older thread which contains a number of links to other excellent websites with specific information, including photographs and diagrams. However, that thread is locked to new postings as it had reached 100 pages, making it difficult to find PSU repair information; also some of the older information can be misleading. The newer thread contains the latest knowledge and recommendations which have been gathered over the years. The objective of this guide, which exists thanks to the fine work undertaken by several people, is to provide key information in a single place. In particular, there is a Web page with a Topfield SD PVR (5800) Power Board Circuit Diagram and some excellent reference material including labelled photographs of the PSU, and a PDF file with an excellent walk-through of the repair process, complete with photographs of each stage, although it only shows the main 6 capacitors being replaced. As the machines age, it has become advisable to change more capacitors than these. There is more up-to-date information available on andyfras's website. Checking voltages inside the PVR will indicate whether capacitors are a likely cause of trouble, as discussed below. However, by 2016 any TF58x0 that has seen moderate use is old enough for a fairly large-scale capacitor replacement to be desirable if there are any signs of trouble. A multimeter, and the circuit under test, can be damaged if the wrong range is used; unless you are familiar with its use, when checking voltages switch it only to DC voltage ranges (not current—A, mA, μA—or resistance—Ω, kΩ, MΩ—or other). Start at a high voltage range (e.g. 400V) with a non-autoranging meter, and decrease the range until you get a good reading. Before going any further, it is an unfortunate necessity that the following warnings and disclaimer are included in this guide. Although the replacement of the capacitors is a relatively straightforward repair, there are some risks. First and foremost, inside the Toppy are some components that are fully exposed once the cover has been removed that carry live electrical voltages that could potentially deliver a fatal shock if touched. Be particularly careful of the heat sinks (see the photograph in this post), which will not only get hot enough to give you a nasty burn from the heat, but are also at a lethal 350 volts. Even after the Toppy has been unplugged, the Toppy will retain significant residual charges on the 240 volt side of the power supply circuit that are sufficient to injure or even kill. The residual charges will dissipate (except with some faults), but this will take a few moments. You have been warned. Secondly, there is always the risk of doing more harm than good, especially if the repair is carried out incorrectly. It is possible for carelessly-placed screwdrivers and tools to make destructive short-circuits if power is applied, or even unpowered if capacitors are still charged; this can cause irreparable damage. Although by 2016 warranties on the TF58x0 machines will have expired, any warranty will be voided by removing the cover of a Toppy. If you do not own the Toppy, you must get the owner's permission before you start. If you are under 18 years of age you must get an adult to supervise anything you do. While the information provided here has been provided in good faith and all possible due care has been taken to ensure it is accurate, the authors of this guide and any links referenced by it cannot be held responsible if anything goes wrong. To be clear, anyone who undertakes a repair does so at their own risk. If you fry your Toppy, burn your house down, or kill yourself, don't blame those who have provided information in this guide. By following this guide you are accepting this disclaimer and agree that the only person responsible for your actions is you. Does the PSU need repairing? Before embarking upon a repair of the PSU, it is advisable to first see if any problems being experienced can be resolved without touching the PSU. Check that a good signal is being received, check the firmware is up to date, check there are no duplicate channels and check that no TAPs are the cause of your problems. See CW's Guide to a Stable Toppy for a more comprehensive exploration of these possibilities. The next step is to check the voltages provided by the PSU. Checking the voltages requires the cover to be removed so that you can access the internal components. You will also need a multi-meter, which you can obtain from most good electronics stores. The power supply problem is so common that some people routinely replace capacitors as soon as symptoms appear, without measuring voltages (this also avoids unnecessary running of a PSU which might be generating damaging voltages). When testing the voltages it is preferable to have the Toppy operating under load, which means the hard drive should be in use. The easy way to ensure this is to enable time shifting. It is also preferable to have a signal to the tuners, so the Toppy needs to be connected to an aerial. However, if the Toppy won't operate properly, this may indicate the voltages are incorrect even without the hard drive running, so it's still worth doing the tests even if you can't get the drive going. To remove the cover start by unplugging the Toppy from the mains. It is advisable to wait a few minutes to allow the charges to dissipate further - the voltage will discharge in approx 5 minutes with the mains plug disconnected but only on a fully working Toppy. Since you are attempting to check a suspect PSU, caution is advised. The cover is held on by five screws and once removed you can access the power supply. See Topfield SD PVR (5800) Power Board Circuit Diagram and  for photographs illustrating the inside of the Toppy and the layout of the PSU. Topfield SD PVR (5800) Power Board Circuit Diagram provides circuit diagrams and explains how to test the voltages using your multi-meter. Remember, the Toppy needs to be under load so it needs to be turned on. This means the PSU is LIVE - please be careful when testing the voltages and as mentioned above be particularly careful of the heat sinks. Take a note of the voltages measured on each pin of the PSU connector and compare them with the reference voltages which are (from top to bottom) 5V, 12V, 30V, 22V, 17V, 8V, 5V, 3.3V and 15V. See Voltages courtesy of Toppy Tools. The key voltage is the 5V line. If this deviates by more than 5% (less than 4.75V or more than 5.25V) then the capacitors need replacing. The normal reading for the 22V is 24.5V and the normal reading for 8V is 7.5V, the 12V, 15V, 17V and 30V can also be up to 1V adrift. If in doubt, post your results in the Toppy.org.uk PSU Repair thread. If the PSU does need repairing, you are strongly advised to unplug the Toppy and not use it until the repair has been completed, otherwise you risk a much more expensive repair if other components are damaged. Topfield power supplies mostly fail by aluminium electrolytic capacitors becoming degraded in ways which cause several voltages to change. The capacitors themselves degrade in ways not detectable by most instruments, but measurable changes in voltages implicate the capacitors as culprits. A multimeter with capacitance ranges will identify capacitors which are short-circuited or leaky, or have changed capacitance; but a capacitor with the usual problem of high equivalent series resistance (ESR) will measure as being in order; ESR cannot even be measured on a resistance range. Capacitors may bulge or leak, but very often go high-ESR with no visual sign. Only a specialised ESR meter will show that the ESR is much higher than normal. In cases of degraded capacitors repairing the Topfield, if caught before uncontrolled voltages have caused further damage, is a simple matter of replacing most or all of the electrolytic capacitors in the PSU. Obviously, the first step is to obtain replacement capacitors, de-soldering braid or solder sucker, solder and a soldering iron. The braid, solder and iron are fairly straightforward and can be obtained from any good electronics store. Examples of each can be found at wire, braid and iron. General-purpose capacitors of unspecified ESR from an electronic components shop, while initially restoring correct functioning, are not likely to be very durable. Low-ESR capacitors are not expensive; a distributor may supply them at a lower price than unsatisfactory capacitors from a shop. The choice of capacitors is the subject of some debate, but there is no disagreement that a straightforward replacement of capacitors by others of the same capacitance and voltage rating, but also of low ESR and with a maximum temperature rating of not less than 105°C, is an obvious option, for example these or the Panasonic FR (low ESR, extra-long life, 9000 h @ 105°C), FM (low ESR), and FC (higher ESR than the others, but still low) series. Suppliers of suitable capacitors at reasonable price include Farnell, RS, and CPC. Toppy forum member andyfras can supply kits at a reasonable price to supply the correct capacitors and avoid minimum order restrictions with suppliers. If you have never soldered before, there are numerous websites with explanations and videos that can be found with an Internet search engine; look also for advice on desoldering and removing "through-hole" (as distinct from "surface-mount") components, electrolytic capacitors in particular. It can help to find a scrap circuit board to practice on without risk. If holes remain blocked with solder after removing components, clear with a wooden toothpick or stainless steel tool while the solder is molten, or tap the board on a table to knock the solder out. Once you have the tools and the parts, you need a workspace with good lighting and sensible ventilation. It is also advisable to protect the workspace from rogue solder with some cardboard. Unplug the Toppy, place it in your workspace and allow any residual charge to dissipate. You can then proceed with the actual repair. An alternative to all this is to send the power supply, or the complete PVR, to have its capacitors replaced professionally, at a cost of around £30. Toppy forum member andyfras can provide this service, if required. For the replacement of the 6 main TF5800 capacitors which fail first, the procedure is well documented with photographs at . However, by 2014 all are likely to need replacing. The capacitors which usually fail first are C17, C18, C19, C22, C23 and C25. From about 2013 it was advised for long-term reliability to replace the other capacitors too:- C26 & C27 (470μF 10V), C20 (470μF 16V), C13 (100μF 35V), C15 & C16 (100μF 25V), C9 (47μF 50V), C12 and C14 (470 μF @ 35V), C10 (470μF 50V) and C7 & C24 (1μF 50V). The big 150μF @ 400V capacitor rarely fails and would not cause the same symptoms. Any 5800 that has survived until 2014 will require the replacement of all 18 secondary electrolytic capacitors. These can be supplied as a kit by Toppy forum member andyfras for £9 inc. postage (2016). Main 6: 1000μF (C22 should be uprated to 1200μF; 2200μF @ 10V, is used in later 'Facelift' versions of the PSU). Others: Same as originals. Slightly higher is OK if it fits in the space. Case diameter: As the original (thinner is OK, but may mean lower ripple current capability; fatter only if there is room, many are closely spaced). Many are 10mm. Low ESR (Equivalent Series Resistance), sometimes stated as "low impedance"
The Panasonic FR, FM and FC capacitors mentioned above fit easily in the space available with the exception of C10: the Panasonic EEUFM1H471 (470μF @ 50V, the same as the original) is a little fatter than the original, but can be fitted if the leads of the replacement for the adjacent C17 are a little longer and bent to fit. The tricky parts of the process are first of all identifying the correct capacitors to replace and then removing the old capacitors, which just takes some patience. 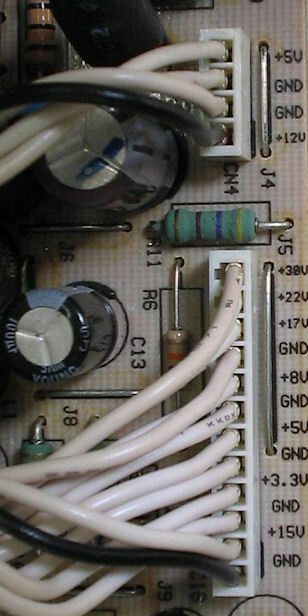 To help identify the capacitors, Repairing the Toppy shows them from the front and this photograph shows only the 6 main connections at the back. Double check that each capacitor is fitted the correct way around - compare the stripes to the photo mentioned above. With the capacitor removed, the top of the PCB shows a circle where each capacitor is fitted, with an obviously thicker section corresponding to the negative lead (stripe). Once the repair has been completed, retest the voltages. Remember, the Toppy needs to be operational for this test. If all is well, put everything back together, pat yourself on the back and enjoy a working Toppy once again. Some people have reported problems with the TF5800 3.3V line being too low even after replacing the first six capacitors (a good reason to replace all 18 capacitors). Since this powers the CPU, a low voltage on this line can cause all sorts of problems, including reboot loops, crashes, losing all the channels and failing to wake from standby. The solution is to replace capacitors C26 & C27, (470μF 10V). This or this one will do the job. These capacitors are included in the 18 capacitor kit mentioned above. Later 5800 PSUs with Samxon capacitors often fail with the 3.3V line going low and noisy before other voltage changes become apparent. This is due to the poor-quality green C25, which fails before the other black 1000μF 16V capacitors. The 5810 PSU is much simpler than the 5800. It is possible to run a 5810 on a 5800 PSU, but probably not advisable on a long-term basis. It may be possible to run a 5800 on a 5810 PSU too. The mainboard connections are the same (note that 24V is not used on either mainboard). The main capacitors to replace are C8, C10, C11, C13, C14, C16; It is also advisable to replace C4, C9, C12, C15, C17, C18 & C19. See photo of 5810 circuit-board. The green Samxon capacitors used for C8, C10, C14, C13 and C16 often show 'doming' as they fail—the normally flat top bulges, and may show signs of leaking or opening. † 390μF 25V has been substituted for the original 330uF 25V for C13 and C16. A bit of extra capacitance should help stability in these critical positions. These can be supplied as a kit by Toppy forum member andyfras. A TF5810 PSU circuit diagram is available. This is not an official Topfield diagram; it has been provided by andyfras by working backwards from a 5810 circuit-board and modifying the Topfield SD PVR circuit diagram mentioned above. So there may be some minor errors. When repairing a 5810 PSU, it's advisable to change the front panel clock battery (2032) at the same time. This page was last edited on 9 November 2016, at 13:13.